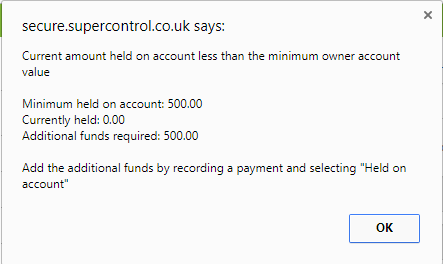 Help CentreSuperControl AGENCY features Paying ownersHow can I hold money on my owner statement account? The purpose of “Held on Account” is to enable you to keep money from the owner to use should unforeseen expenses need to be paid. For example, you can “hold” £500 on an owner’s statement (money paid to you by the owner), then if any cleaning/maintenance or other unexpected fees arise, you can use these funds to pay them. 1. Go to Agency > Edit owners > click Edit against your chosen owner. 2. 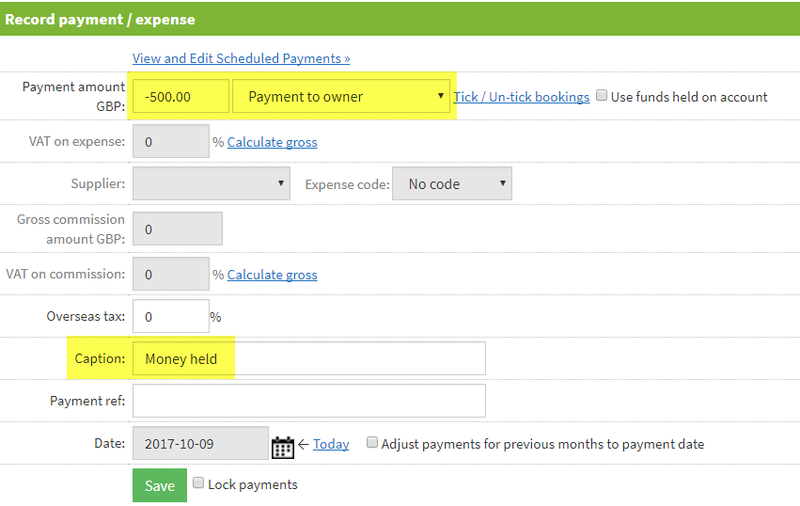 Scroll down to “Commission settings” and enter the amount you will be holding in the “Minimum owner account value” field and click Save. 5. To mark the £500 as being held, select “Held on account” and enter in the amount you’re holding eg. “500”. 6. Enter a caption eg. “Money held” and the date, then click Save. It will now display on your statement underneath. 7. To finalise the holding, tick Money held only, ensure “Payment to owner” is selected, enter a caption eg. “Held”, enter a date and then click Save. 1. In the owner statement tick the expenses you want to pay. 2. Ensure “Payment to owner” is selected and tick “Use funds held on account”. 3. Enter a caption, date and click Save. 4. You will now see your held amount has decreased. 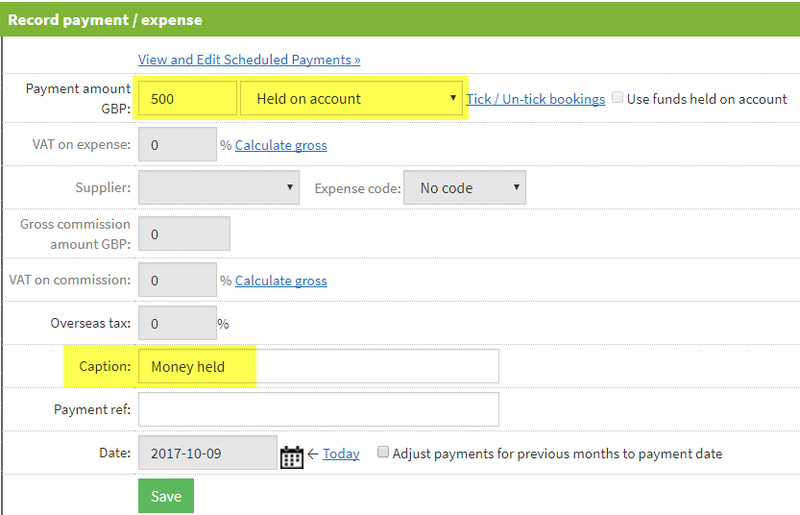 Prev: How do I allocate an option/extra payment to an owner? Next: How do I add suppliers?